Since that’s roughly a buck for a little over four pounds of fruit, I stopped right there, and took as many as I could carry off his hands. And then, he threw another bunch in my basket after I paid. So I had a whole bunch of bananas…five, to be precise…which was great. But I was a little concerned about having what looked to be like around fifty bananas for just one person. Once home, as they started ripening during the week, seemingly all at once, a mild panic set in. So I called into service a recipe from my archives, one of my all-time favorites: Banana and Chocolate Chip Upside-Down Cake. When I had my site revamped a few years ago, recipes from the older site weren’t able to be part of the transition. So they’re still there, in the old format, and I can’t change them nor can readers comment. And I kind of forget about them, until someone mentions them to me. So aside from making a dent in my banana stash, I got to re-visit that recipe. The recipe for this cake is something I developed for a magazine that specialized in low-fat, or “healthy” food quite while ago. Instead of feeling cornered by having to bake with that restriction in mind, I found it a good challenge, because you can replace the traditional overload of butter or eggs with things like chocolate and fruit puree. Not that they have less calories, but you can easily get away with using less of the ‘forbidden’ ingredients, if you replace them with very flavorful ones. Here I used ripe banana puree and low-fat sour cream. You can use regular sour cream, but once baked into the cake, if anyone can tell the difference, I’d say that’s one sharp palate they’ve got there. And I use chocolate pieces, which give the cake little bursts of chocolate flavor, and happens to be exactly the right of chocolate to go along with the the bananas in a pool of deep-dark sugar. Every time I make this cake, I wonder why I don’t make it more often. Who wouldn’t like a tender cake studded with melting chunks of chocolate, the rich-tasting batter scented with a hint of cinnamon, and rows of bananas lined up on top, gooey and caramelized in a pool of brown sugar topping? Curiously, once I got through all the bananas, I was at another market yesterday—late again, and the same thing happened. I guess there must be a surfeit of organic bananas in Paris right now. Which, once again, I’m peeling through as fast as I can. When I originally developed this recipe, as mentioned, I was writing for a magazine that requested low-fat recipes, hence the single egg white. But if you’re not all that concerned, simply add an additional egg, yolk and all, and reduce the sour cream by one tablespoon.If you live somewhere where sour cream isn’t available, you can use buttermilk, plain whole milk yogurt, or fromage blanc. You’ll notice that you can use either butter or water in the topping. If you’re skeptical, I can honestly say that the non-butter version is really good. But for non-believers, go ahead and add a few tablespoons of butter instead. 1. 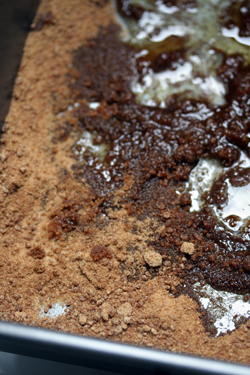 To make the topping, place the brown sugar and water or butter in an 8-inch (20 cm) square cake pan. Warm the pan directly on the stovetop over low heat, stirring until the sugar is thoroughly moistened. If using water, simmer the mixture for about 45 seconds. If using butter, stir just until the sugar is moist and bubbling, then remove from heat. (It won’t melt completely smooth, and there may be a few bare spots, which is normal.) Let cool to room temperature. 2. Peel and slice the bananas in 1/4-inch (1 cm) slices. Arrange them in slightly overlapping rows over the melted brown sugar. Sprinkle with a few drops of lemon juice. 3. Preheat the oven to 350ºF (180ºC). 4. Whisk together the flour, baking powder, baking soda, salt, and cinnamon in a large bowl, making sure there are no lumps. Mix in the granulated sugar. 5. In a small bowl, mix together the butter, egg, egg white, banana puree, sour cream, and vanilla. 6. Make a well in the center of the dry ingredients and stir in the wet ingredients until almost combined. Do not overmix. Gently fold in the chocolate pieces. 7. Scrape the batter into the pan over the bananas, then use a spatula to carefully spread the batter over the sliced fruit. 8. Bake for 40 minutes, or until the cake feels just set in the center when you touch it. 9. Cool the cake for about 20 minutes, then run a knife along the edges of the cake to help it release from the pan. Invert the cake onto a serving platter. Serving: The cake is best served warm with whipped cream, vanilla ice cream, or by itself as a snack. If made an hour or so in advance, it can be inverted on the serving platter, and left with the cake pan over it, to keep it warm. Otherwise is can be rewarmed in a low over, covered with foil. Or enjoyed at room temperature. Storage: The cake can be made up to two days in advance, although it is best the day it’s made. To freeze it, wrap it securely in plastic wrap; it can be frozen for one to two months. This recipe is such a good idea! 5 (!) bunches of bananas for 1 (!) person! I’m impressed! LOL! i think i’ll just make and eat this for breakfast thank you. it has my favourite things in it. Deux kilos pour un euro-voilà ce qui n’est pas cher! Le cake a l’air vraiment bon. J’adore le chocolat et les bananes ensemble. Banana and chocolate is one of my most favorite combinations. This looks mouth watering. This looks great. I am tempted to make it and then take a large slice just for myself to tempt my workmates with. 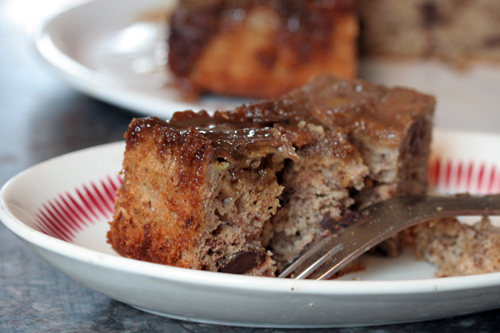 I have just enough organic bananas languishing away in my kitchen for this recipe. They’ve needed a purpose for awhile. Let’s just say they are way too ripe to be consumed by the banana gourmands with whom I live. In this house, a spotted banana is a lonely banana. I have grown accustomed to throwing the under-appreciated uneaten and unpeeled into a freezer bag for use at a later time. My current ripe bunch now has a destiny – the oven! Thanks for this recipe! Do you know any good places where i can go and have afternoon tea (in Paris), except from the Ritz? Aww, this makes me really wish my boyfriend liked bananas. :( This looks gorgeous, and I hate baking just for myself. *sigh*. I wish *I* liked bananas sometimes. I have some banana’s starting to look a bit tired in my kitchen just begging to be bakes! Sounds lovely, I’ll be baking that tonight. Oh wow – this is amazing, and perfect timing since I’ve been on a “banana dessert” rampage this week for some reason. First it was banana yogurt on Monday morning, yesterday evening a banana tart, and now this! I want to make it immediately!!! Smoosh up the rest and freeze it. Here in Florida, we have them in our yard and whole stalks go ripe, luckily, a little at a time, but still, thats too darn many bananas. In 3 banana bags, I can have banana bread all year. this looks amazing, and right up my alley. would it be overkill to fold in some nutella? i’ve got a ton of nutella, and bananas just sound like the perfect compliment. Congratulations on your massively amazing deal on bananas! How unfortunate that such deals never occur in America…. There is probably nothing else that can get my attention like chocolate and bananas does. And on a rainy day in St. Paul, MN., baking a cake sounds like the perfect thing to do. Bananas and melted choco – mmmmm. Baking soda is not available here – can I subsitute more baking powder? ohhhh seriously i love this. This sounds delicious and since our group of friends all started an iron chef theme (where the next one is cinnamon!) I’m definitely going to have to bring this and the best part is it’s a healthy recipe! Anna: In the headnote, prior to the recipe, I list three alternatives to use if you can’t find sour cream. If you can’t find one of those either, you can make your own buttermilk by adding a teaspoon of vinegar or lemon juice to 1/2 cup of whole milk and letting it sit 10 minutes. Audrey: Yes, you can freeze them. But my freezer it packed to the rafters…with ice cream! Mmmm..the topping sounds almost like Banana’s Foster..just add liquor and fire it up! Well, except the cinnamon is in the cake instead. Nice change from regular banana bread. 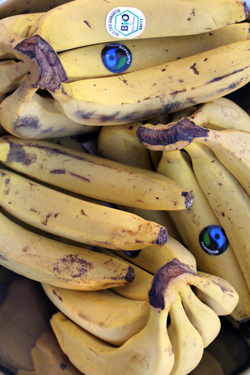 Here’s another recipe for using up lots of bananas in one go. The best bit is the faux (instant) banana ice cream made by freezing chopped bananas for 1 hour, then blending with or without extra ingredients = fresh banana ice cream! Must admit that I have not yet tried this myself but the bananas await in the freezer. Bananas inside and out, my grandchildren will love this cake. I always have ripe bananas in my kitchen and I like recipes that use so many wholesome ingredients, thanks I will try this one soon! David, without knowing it, you’ve recreated one of the most popular desserts in Brazil – you can find banana upside down cakes in every bakery here. Love the chocolate twist idea. wow I have to find this magic banana man! as i sit here i’m polishing off the last crumbs of my breakfast…banana bread with a few bits of dark chocolate thrown in…i figure i can get away with it if the rest of the recipe is very healthy(which it is! )……yet now i want to go make some of this cake.. Thanks David for re-posting this. I’ve made your banana bread/cake recipe made in a loaf pan twice in 2 weeks and have bananas and an egg white designated for my third batch. My family loves it. I think this cake is divine with cacoa nibs (a subtle chocolatey nutty flavor) as you suggested from a previous post and I made the second batch with the topping (just as good without it). I think this recipe is so perfect as written, I am reluctant to make any changes like using a whole egg rather than just the egg white, even though I have no real reason to keep low fat. I just use the extra egg yolk to make custards for your ice creams. :) Just one question, how do get your cake to bake evenly so when inverted it lies flat on the plate? And to Alex above, make the cake in a loaf pan with (one or two bananas is enough to fill the smaller area of the loaf pan) or without the topping. Eat slices off it for breakfast, for a mid morning / mid afternoon / midnight snack . It will be gone in no time without your boyfriends help! I can’t seem to make it fast enough around here. And I have to pay $US4 for a kilo of organic bananas here in Australia! Jung: Glad you’re a fan of this cake! I have a large very flat plate (which they call a pizza plate, around here) and the cake sits perfectly flat on it. It’s similar to this pizza/cake plate, but you can likely find one close to home at a cookware store. I think I paid €3 for mine at La Vaisellerie, which is a great place to poke around in Paris. Jennifer: Thanks. I also linked to an ice cream of mine at the end of the post that’s pretty simple, too. (The Easiest Chocolate Ice Cream Ever) I also heard of people taking frozen bananas and pureeing them with cocoa powder, but I haven’t tried it. But it sounds good! My brain just had a bit of a moment, the sweet-craving center just sort of exploded…. Love bananas. Love Chocolate. Love the Recipe. Sweet. Freezing ripe bananas is always an option too! This cake looks delicious. I just used up my frozen ripe bananas this past weekend for banana bread. Luckily, my local store has bananas for 49 cents a pound, so I always can stock up. If you still have some of those bananas, I have a banana pie recipe that i’m drawing for the site recipelook. foolproof and what is great is that it’s another use of a lot of ripe bananas at once :D.
looks divine ! you’re going to find a lot of your readers hitting up the paris markets just before closing now ! ;) at the market here in zurich where i go, there is a “sale rack” with tired lettuces, mushy tomatoes… and brown bananas. curiously, no one touches them – and then i swoop in and take ’em all. i think they literally put them out for me now. better not share this recipe with any swiss germans here, i’ll have some competition ! so… what did you do with the other 45 bananas? Yes! I LOVE upside down cakes. I might use a tiny bit of dark rum when I make this though (for the cake, not for me). Oh, mon dieu! I will definitely bookmark this recipe! I can’t wait to try it! Thank you, thank you, merci for sharing! I’ve been in the mood to make chocolate banana bread again, but this looks better. I’ve used yogurt, so that could be a low-fat alternative to the sour cream. What do you think? Did you use semi or bittersweet chocolate for this? I’m a bittersweet girl, but someone told me it wasn’t sweet enough in my last choco-banana bread. 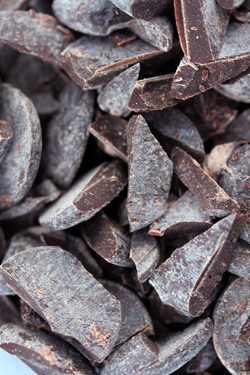 What’s your take on which chocolate works best? 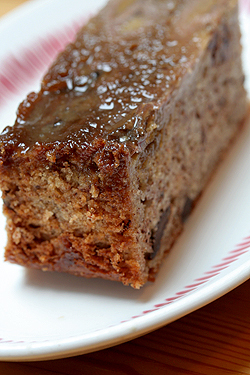 Your description of the carmelized bananas is going to make it difficult for me to last the day without this cake. This sounds extremely nummy, David. Funny because this weekend I also bought a truckload of bananas from my farmers market for a dollar. Where are all these bananas coming from?!? It’s a banana boom! 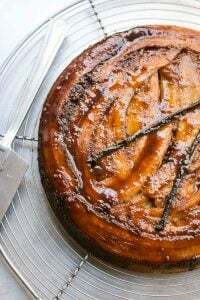 All this banana-upside-downiness has made me consider making a banana tatin. With rum. And vanilla ice cream. I can always rely on this website to get the creative juices flowing! Cheers David! EDIT: Rum raisin ice cream – yeah baby. Thank you for the recipe and the great timing. I was just wondering what to do with all my Costco bananas. Of course, I bought too many because they’re so cheap! This looks divine. I am absolutely addicted to bananas right now. I just made a trifle with strawberries and sauteed bananas as well as banana pancakes last weekend. THANK YOU! left my chocolate pieces too big which meant my chocolate was a bit too deep a taste but otherwise very good with some vanilla ice cream. now i’ve got about 5 portions to get through. I know what i’m having for breakfast! Oh, YUM! This one is a keeper and I may actually cook it rather than just add it to the huge pile of recipes that I swear someday I’ll try. Thanks! Um, yum. I like this….alot. 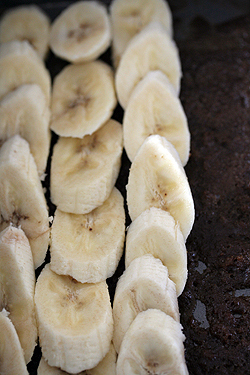 Chocolate + Bananas = Small Homemade Miracle. I think it’s funny that Cynthia keeps collecting recipes that haven’t been used yet, because I do the same! But this one will definitely be used. This recipe came at a providential moment. My English After School Club teacher recently told me the kids are looking for some new recipes to try out. Despite her being scared of the deep-fryer (and despite having already broken one), I dragged out my back up fryer for them to make funnel cakes. Can’t remember where they originated but the Pioneer Woman had about 11 pages to that recipe, whooh! I guess my teacher will be happy to do the banana chocolate chip cake instead (and so will the kids). We even have some organic bananas sitting on the counter courtesy of my banana-loving husband. I’ll be glad to get rid of them before they turn black and attract a swarm of those pesky fruit flies who then make a bee-line for my vinegar jar. Thanks for the post and the recipe. I have often made the banana cake from Rose Levy Berenbaum’s Cake Bible and topped it with chocolate frosting, which is pretty heavenly. This, however, sounds both easier and less sinful, so i can’t wait to try it. Sadly, bananas are neither as cheap nor as plentiful in Colorado as they seem to be in Paris, but i somehow think it will be worth the investment. Thanks for yet another yummy-sounding recipe, David! PS: I made Deb’s Black and White cookies on Oscar night and they were divine:) As an east coast gal, i can honestly say that they were as good as the best of ’em and better than the rest by a lot! Don’t be a barbarian — FEWER calories. Everything else, gorgeous. Especially admire chatty way you write a recipe. wow — I never realized that bananas could be so good! David, how can I parlay bananas to be with Olivier? I am ready to fly back across the Atlantic just to be with him. Wow, David. This recipe is fantastic. Chocolate + Banana + all the other stuff you added in the cake = HEAVEN. I’m sure you’re familiar with the various brands of chocolate available in SF. Is there a particular brand you would go with? I love bananas and chocolate! omg what a dreadful imagining – no sour cream, i don’t think i could last very long, culinarily that is. Curiously, it seems there might be a surplus of organic bananas here in Israel too. Perhaps people are not buying the concept of organic bananas, since they aren’t usually associated with pesticides, as are other fruits. I found myself buying 4 kg of them! I did make a really nice banana & cream cobbler pie, which took 1/2 kilo off my hands. Looks delish. Funny that you should post this again now … in Australia a story has appeared in a few publications this week re most Googled recipes. Apparently banana cake and banana bread are second and third behind pancakes, closely followed by scones and pumpkin. Seems we love an ole fashioned favorite. See link at Sydney Morning Herald. How topical! I made this last night for the midwestern frat boys I cook for and of course my daughter and I had to try it first – to die for! Best Cake Ever! David, When are you coming to Central Market in Texas to promote your new book? Which market and day was it? I love trolling the markets at the end for the deep discounts. I, too, recently had an abundance of bananas, and made a banana-pineapple-papaya upside down cake in a cast iron skillet. Made with sifted whole wheat flour, it was great for breakfast with a cup of coffee. Your photos are inspiring me to make another one. Thanks for another great post. Thank you! This sounds so yummy. How are you able to stay slim and trim with such a dedicated gastronomical lifestyle? Kathleen: I actually often swap out some of the white flour for whole wheat in cakes like this, that benefit from being a bit heartier in some cases. I have a cast iron skillet that I use, which I used when I made this upside down cake. Although for some reason, I like this one in square or rectangular pieces. Margaret: I love Central Market. But at my age, it’s strenuous all that traveling and teaching in a short week. I miss the store very much, and if I could just go and eat Mexican food with the staff and the guests, I’d be there in a minute. CanadianKaren: I omit one egg yolk in each cake I make. jess: Richard Lenoir and Marché d’Aligre. ann: Sounds like I need to go to Australia. I’d be right at home! That look great! 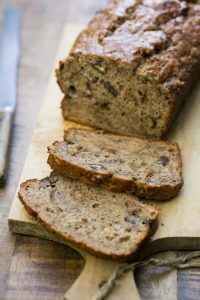 I always add almonds or walnuts to my banana bread for a little kick. Ida: Try Ladurée for tea. Just lovely! I adore your posts! Always a fabulous recipe with a hint of that smooth, dry humor. Love it! This looks amazing! And the fact that it is low(ish) fat just reduces the guilt in eating a huge hunk of the cake. There is nothing better than chocolate and bananas, but I have to imagine you’re pretty tired of banana anything at this point. Thanks for the recipe! David, tonight when I was doing my grocery shopping and strolling through the produce section, no mec foisted his bananes upon me. What am I doing wrong? I too came across an obscene amount of ripe bananas in the discount produce bin at my local co op. 20 lbs worth to be exact. I received my fair share of glances with a few look it’s the crazy ripe banana girl since I am no stranger to that section of the store. I have a banana habit. Admitting is the first step. I took them to the fullest ripening point that I can allow, which is black, with a few yellow polka dots. Then I dutifully peeled them all and stored in my freezer for my future baking needs and my protein smoothies. I made this tonight and this will now be my staple banana cake base. I didn’t have any fresh bananas as I am trying to stay low in that sector of my local store! I thought the thawed bananas for the topping would release too much moisture so I proceeded with the butter sugar step but added shaved toasted almonds which worked well. I also had a meyer lemon that needed to be used so I zested and squeezed a little juice into the banana puree. I like turkish ground espresso in my banana breads so I also added a heaping teaspoon to the wet ingredients. This is such a good base recipe! Overripened bananas, what a deeply lovely thing. They’re much more deserving than the garbage can! This recipe looks so fantastic, I must try it! I visited Paris this past September, and fell utterly in love! It’s also how I found your blog while doing my pre-trip research, and also discovered all of your wonderful books etc. I’ve never commented before, but this recipe looks so good, and ‘good’ for you too?! yeehaw. I love reading your words, thank you, very inspiring! Hi David, if I haven’t got brown sugar, could I use white sugar plus molasses? Would I need to caramelise the sugar then? Henry: It should work, although I can’t say for sure because I haven’t tried it. If you do, let us know how it comes out. And btw: where you do you live where there’s no brown sugar? Ida &Hallaryn: Thanks. I don’t ever go out for tea, so appreciate the suggestion. Thanks for mentioning about the low-fat versus regular sour cream. I usually use the low-fat version in baking and wondered if my not noticing any difference was due to my unsophisticated palate. Cheers! I made this tonight and it was a big hit with my friends! I loved it too! Thank you very much!!! One note: I totally forgot the lemon juice drops on the bananas, but it still tasted amazing…I don’t know what it does for the flavor but if you don’t have a lemon you could definitely still make this! This looks so amazing. I too stock up on bananas all the time, sometimes making it impossible for me to utilize all of them or simply eat them. I got so excited looking at this recipe! I’m gonna make this… soon. Hello David, I had to thank you – I made this cake for last night’s dessert – for a friend who is strictly vegetarian and doesn’t even take eggs (and that makes my life very difficult). Of course, I left out the egg parts from your recipe, used a teaspoon more of sour cream, and forgot the lemon juice too. Made up with a tad more of the choc chips though. Can’t say how forgiving and blessed this turned out to be. All of us loved it. Thanks a tonne. I love your blog, and here’s why. One day I forwarded your url to my husband (we are both francophiles, headed for Paris in June!) and he’s been reading your blog ever since. So tonight he’s cooking me a meal from a recipe you recently posted. I have NO idea what it is, as I’m not allowed in the kitchen until dinner is served. What I do know: it smells heavenly and I can’t wait to find out what it is!!! I owe you a big thank you, I could get used to this life real quick! Bananas, Chocolate and Cinnamon: It looks and Sounds delicious combination. Thanks very much for the recipe! I made this in high altitude (8600 feet) and it still came out delicious (that’s saying something!). I just added an egg and halved the leavening. I love cakes that need no icing. Possiblement c’est le meilleur gateau de ma vie. Merci encore! David, I stumbled upon your blog by accident (I can’t recall what I was looking for originally). It is amazing how, with but a few clicks, one can stumble upon something utterly delightful! I have a self-imposed rule that my bookmarks bar must remain relegated to academic links and references, lest I get distracted when I come online to do work (which I can’t seem to escape – but perhaps it’s for the better!). I would just like to compliment your work, for you’ve weakened my resolve. Now, a link to your site rests between that of my department’s university homepage and a literary magazine for which I am an Editor (www.sixersreview.com)! Thank you for this superb-sounding recipe. I am on my way out the door now in search of some bananas! Also, I’m not convinced the lemon juice serves any purpose – is it to keep the bananas from browning (which seems pointless as it’s going to be baked) or do you actually intend that it imparts some flavor? Finally – I’d do more chocolate chips as well. probably closer to 3/4 or 1 cup. Still, this was incredible. Kudos! Made it this morning! Used buttermilk in the cake and water in the topping, and everything came out great. Thanks for the recipe – I’ll definitely make this again. Upside down cake is the best! Thank you, thank you! Made the cake with yogurt instead of sour cream and it was great. Everyone who tried it in m office moaned with pleasure, they said it was too good to be legal! This looks fabulous! Bananas, however, seem to be difficult to come by in the small French town I live in. I plunked down a big bunch of super-green bananas at the Superette, hoping to make this cake in, oh, a week, and the cashier said, “Oh, no, Madame, come back tomorrow. I’ll have better bananas then.” I live in hope. Question: What are good questions to ask of chocolatiers and patissiers to get them to open up about their wares? I’m taking a group of American students for a Parisian chocolate experience and want to make sure they can fully appreciate the experience. Thanks for any help you can give! Maria: Since you live in France, you perhaps are familiar with the natural hesitation there is when dealing with people one doesn’t already know. In Paris, they’re used to foreigners and such, but my advice is to go in an advance and speak to them, so they get to know you. And you might want buy something, to show that you’re there to appreciate what they do. (It doesn’t have to be grand, just a gesture.) I’ve seen people run into a chocolate shop, take a bunch of pictures, and then quickly leave without actually “seeing” anything. Most of the chocolates are made outside of Paris; because of the space required, few places in Paris have the luxury of making their chocolates on the premises. Made this today, subbed 1/4 cup pecans for 1/4 cup chocolate chips. Wonderful! Bananas are not expensive here, especially if ripe. The bottom, covered with banana rounds (which is the top after baking and inverting onto a plate) is not as bright & flashy as as pineapple upside-down cake but just as appetizing. We loved this! 5 bananas in one cake and chocolate too! Very clever. I made something from your archives today, as in “Ripe for Dessert”. The Rhubarb Almond nougatine Tart. Fabulous! Made this cake today and it is fabulous! It may just be the best thing I’ve EVER baked. I made your cake this weekend but forgot to read about the extra bananas needed for the topping. I used some apple slices instead and baked it in two loaf pans. It was wonderful and the recipe is a keeper. I’m so glad that you think of low(ish) fat and delicious recipes. 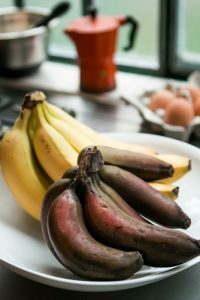 I’ve been very keen to try this recipe since it was posted but an inclination to bake and ripe bananas never seem to coincide in my house – till today. I used yoghurt instead of sour cream. An egg plus an egg white. A loaf tin – about 8 x 28 cm. I required two and a half bananas for the base. And three for the cake. I mixed the batter very little. And it looked a little like it might split (but didn’t). After I poured half into the tin it occurred to me that I hadn’t buttered the tin. I checked the recipe again and there was no instruction to butter – but I thought perhaps David had used a non-stick tin (though the recipe didn’t specify). I considered emptying the batter out of the tin and removing the bananas so I could grease it, but didn’t and decided I would post an irritable message here instead if (as I expected) the cake stuck to the tin. I baked it for 45 minutes and it still looked quite pale so I baked it for another fifteen ish minutes, by which time the cake was quite brown. Removed it and it deflated completely. I suppose that means it was probably under-done…(?) After an hour I thought I’d see if I could get it out and it hadn’t stuck to the sides at all. Was that because of the butter in the caramel? Anyway, it was very easy to get out of the tin. It doesn’t look quite as nice as David’s. The bananas aren’t identifiable on the top. I mean you can tell that SOMETHING is on the top but you can’t really tell they’re bananas. And it IS delicious. It doesn’t really seem under-done on the inside. But next time, perhaps I’ll split the batter between pans… or use a large round tin as I don’t have a square one. Thank you David for the recipe. Wonderful! I like how the topping doesn’t have a ton of butter, and you make it in the pan. I used it with Alice Medrich’s low-fat brownies. Also, I tried to comment on your almond tart recipe, but it’s closed off. The photos really helped, and I’ve already made it three times! Even did it with coconut, chocolate chips, and nibs (so it’s like a Girl Scout cookie). I made this a while ago and have been dreaming about it ever since. It is literally my favourite banana dessert. I love this cake! I think it’ll be my new go-to banana bread recipe. I also completely forgot to put the butter in (I swear I meant to) and the cake didn’t suffer any side effects at all. When I make it again, I might try it with the butter to see if there’s a difference, but there definitely wasn’t anything lacking in taste without it. Thanks for another great recipe! I made this cake today with my friend and have never had such a sensation in baking something. 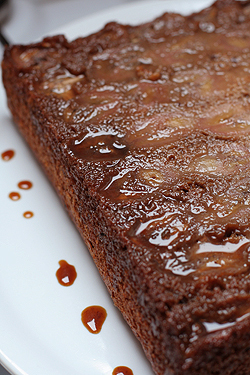 As soon as it came out ‘upside down’ out of the tin, the caramel and banana looked so gorgeous, it made us so happy. Why, the taste, of course, lived up to it every bit: the bitterness of the chocolate cut through the sweetness. Truly an amazing dessert, hot, with vanilla ice cream. I thank you for your existence. Just made this cake for my brother’s visit. IT IS DELICIOUS! He can’t get enough! I had to use light brown sugar because i was out of white sugar, and it still tastes absolutely delightful! I made this last night. It was beautiful and delicious even to those who don’t like banana bread in our house; they asked for seconds, and thirds. 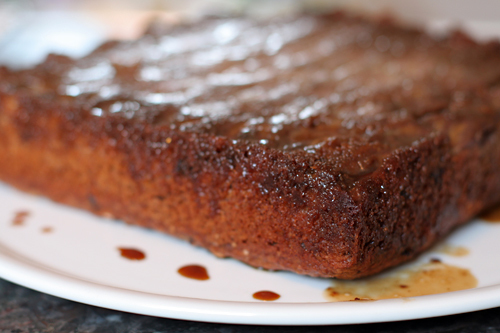 I also do not like chocolate chips in my banana bread, but in this cake with the glaze, they are perfect.